A perfect day - Let's keep that in the sanctity of your brain, shall we? It really was brilliant! Into the city this morning for two marvellous events. 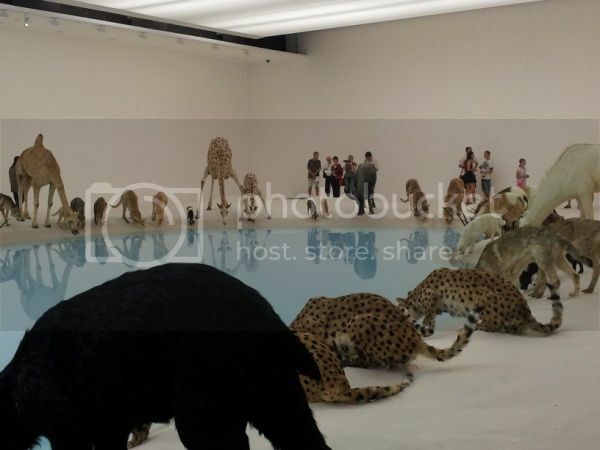 First-up a visit to the Gallery of Modern Art to see the exhibition Falling Back to Earth by Cai Guo-Quiang. It was amazing! It consisted of two main parts; Head On, which was inspired by the Berlin Wall and by Man's capacity to keep on repeating the same mistakes, and Heritage which contemplated the earth as sanctuary for all species. 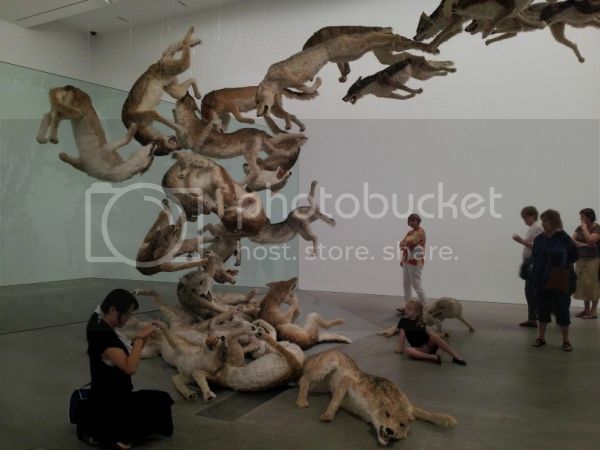 Ninety nine wolves, throwing themselves into the air, only to crash against a perspex barrier; tumbling to the ground, snarling, they quickly right themselves and pad back to the end of the queue so that they can repeat the experiment. I quite literally held my breath when I walked into the room; just the most amazing thing to see. They were so lifelike and I had to battle the urge to touch. If Head On was dynamic and confronting, then Heritage was static and calming in comparison. Ninety nine animals gathered around a waterhole to drink; predators and prey mingled together, with only an occasional bubble rising from the surface of the water to disturb the perfect stillness. There was even a man whose job it was to smooth people's footprints out of the sand; you can see him in that last photo with his little red mop. 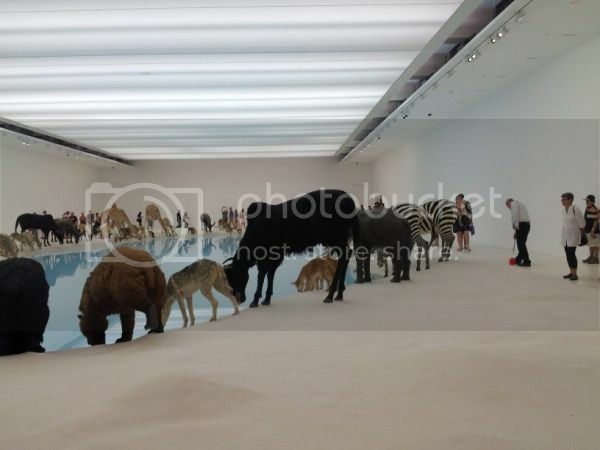 We were lucky to see this - the exhibition is sponsored by Santos and there have been huge protests about their involvement in the Arts, to the point that one protest group had threatened to sneak in at night and dye the waterhole water. 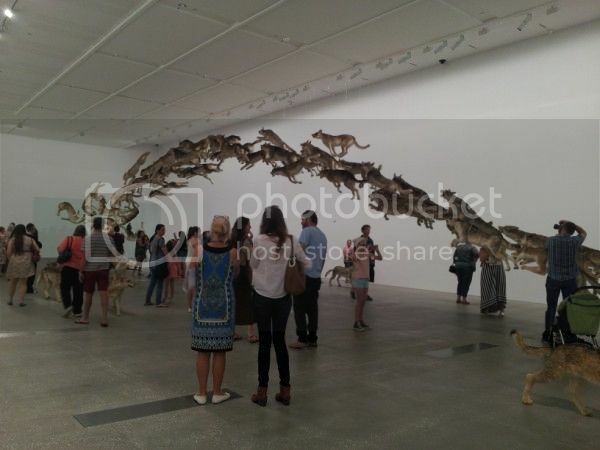 Rather than close the exhibition, GOMA just employed more guards. So that was the morning taken care of. After lunch we walked across the road to the Lyric Theatre at QPAC, to see a stage production of The King and I, starring Lisa McCune as Anna (who knew she could sing?! And sing so well?) and Teddy Tahu Rhodes as the King of Siam. It was brilliant! I'd seen the movie, of course, and was wondering how it would translate to the stage. We were seated in the second row of the highest balcony, so we were looking down on the stage, giving a marvellous view of everything that happened.The sets were gorgeous, very lavish and strongly reminiscent of Thailand; the costumes were marvellous. I loved Anna's dresses, and the jewel colours of the children's clothing, and the sumptuousness of the king's outfits as well as the women's costumes. In the play sequence the costumery was nothing short of stunning. And every time the king's advisor would come on stage I'd momentarily think "Martin Shaw!" but of course it wasn't. I had to wait until I got home to find out who it WAS, though - Marty Rhone! I don't think I've seen him in anything since the 70s. So, all up, a brilliant day. And the weekend's only half-over. Hope everyone else is having a good one so far. What a wonderful way to spend the day! Were the wolves actually moving? Have seen a few print ads for that exhibition and wondered. Didn't know about the other one though. Why on earth would idiots want to spoil such a wonderful piece? I have heard Lisa McCune sing. On TV. She was Maria in Sound of Music, and I was surprised about her voice too. 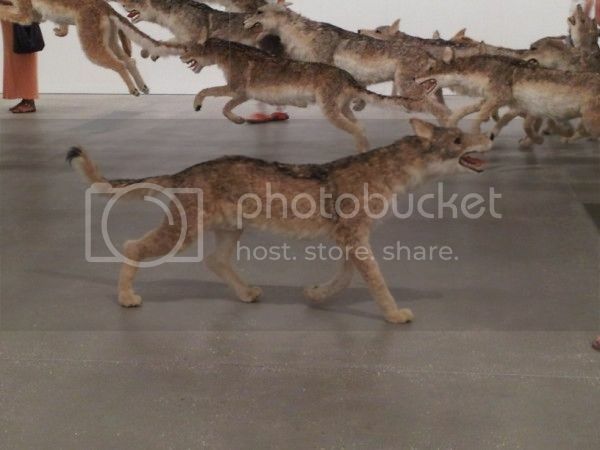 The wolves weren't moving but they are so lifelike in appearance, and captured mid-movement, that they do look like they're about to shake themselves off and go again. I still think of Lisa McCune as the young policewoman in Blue Heelers. She's aged well. Oh good luck! Are you going for any particular role? That is an extraordinary looking art show. Thanks for sharing the pictures. Shall have to keep an eye out for that artist's work here. You're welcome. If he ever exhibits somewhere near you, you'll have to go, it was wonderful. The Head On part of the exhibition was commissioned by Deutsche Bank and first displayed in 2006, while the Heritage part was commissioned and owned by the Qld Gallery of Modern Art. Doesn't get too much better than that. Oh wow, those photos! Thank you for pausing to take them. I don't think I'd have really 'got' the show without those. Fascinating, and I am so glad you got to see them and share them. Thank you! You're very welcome. I don't think I could have explained it well enough for people to get even part of the impact, it really needed to be seen. Even so the photos don't do it justice, it's hard to convey the scale of the works with a 2D medium. I've been wanting to see this exhibition since it first opened in November, and bought my tickets in late February. Then suddenly realised that it's ending soon and I had to get a wiggle on if I didn't want to miss it. 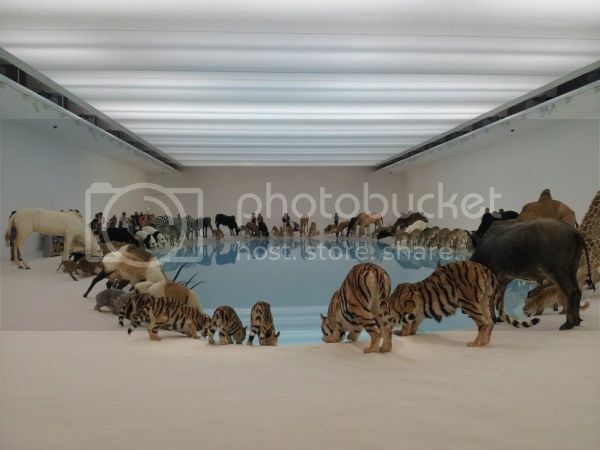 I cannot imagine trying to describe this exhibition, no. There are so many exhibitions I have failed to get my arse into gear for, so well done you! I think it is always worth going to see things, and this one looks glorious.